First, you can share some of the inspiration cards being shown in the list with a group of friends or an online community. Tapping on the “Add people” button in the detail view creates a URL and brings up the sharing dialog of your phone. From there, you can share via any app you might have installed on the device, including social media sites or even mail. Second, whenever the app notifies you that an image is due for one of the reminders, themes or inspirations you created, you can share directly from the app as well. 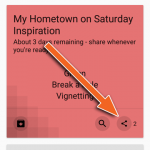 Every inspiration card comes with a “share” button that brings up the device’s sharing dialog. 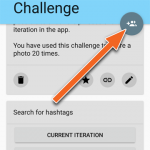 After choosing the appropriate app, you will see suggested standard text for your share, including some appropriate hashtags. Edit the text however you like, add an image and you are ready to go. The default setting is to archive any card after a share – it will return with a new notification next week.